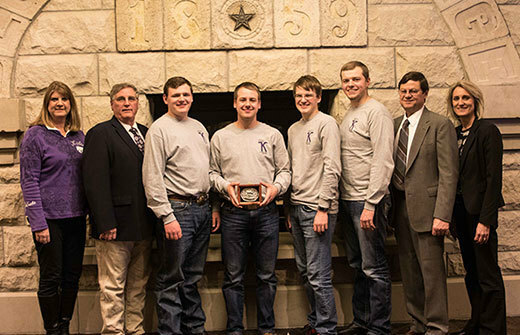 MANHATTAN, Kan. – Four Kansas State University animal science students will be moving on to regional competition after winning the school’s academic quadrathlon recently. The team of Joel Nelson (Soldier, Kan.), Shane Newton (Waverly, Kan.), Joel Martin (Bucklin, Mo.) and Will Patterson (Holton, Kan.) beat 14 other teams to win the annual event. They will advance to represent K-State at the Midwest Society of Animal Science meetings in Omaha March 11-14. Each student received a $200 scholarship and a custom belt buckle for winning the competition. The academic quadrathlon tests students’ skills in four categories: laboratory practicum, written exam, oral presentation and quiz bowl. In the laboratory practicum, teams must demonstrate the ability to perform physical skills. They work at stations involving a species -- such as beef or swine -- or a disciplinary area -- such as physiology or meats. The written exam questions may involve any area related to animal production and products. Each team worked on one exam, dividing the questions as they choose. In the oral presentation, the students choose from a list of topics related to animal agriculture and had two weeks to prepare a 10-14 minute presentation on the topic. In the quiz bowl, questions may be on any topic that relates to animal agriculture and can be answered in a short period of time. K-State’s academic quadrathlon team is sponsored by Fourth & Pomeroy Associates of Clay Center.